Today, I would like to share a guest post from, as he describes himself, a one-man climate injustice campaign: http://www.climatecrimeshumanity.com/about.html. No mincing of words here! Senator, today I read the text of your videotaped message to your climate denial co-conspirators who are attending the UN Cancun climate conference with respect to the failure of the conference. I write to urge you to cease and desist your most deadly campaign of sabotage to greenhouse gas emissions control measures and to the work of all those who are trying to prevent the global warming, climate change and ocean acidification catastrophe to planet Earth. You have the audacity to state that you "couldn’t be happier that nothing is going to happen in Cancun this year." You urge your treasonous co-conspirators to "Keep up the good work — and for those of you in Cancún this week, stay strong, take no prisoners, and enjoy the party!" Celebrating your terrible "success," you state, "I was right and they were wrong" — meaning those who, having a conscience and a sense of human morality, have been working for climate change control legislation in the United States and internationally. You have the most perverted sense of right and wrong. You claim to be a devout Christian. God will surely judge the evil of your deeds by the destructive desecration of His Creation. What you call your "success" in effectively sabotaging the international negotiations for the prevention of global climate catastrophe makes you a leading contender for Public Enemy Number One in America and the world and for all time. You must know that your successful campaign has the world committed to a temperature increase above 2.0ºC which means worldwide climate catastrophe. You may be deluded by your apparent megalomania into believing that America is invulnerable to global climate change. If so, on this you are dead wrong. The latest climate crop models show that the great American agricultural breadbasket of the world will be hit hard by global warming and climate disruption. Your home state of Oklahoma, which you are supposed to represent in government, is right in the middle of computer-model-projected regional heat waves and droughts and so will suffer devastating agricultural and economic losses — at temperature increases that the world is on track for within the next 25 years. On track for thanks to your work. Additionally, if as most scientists believe, the Arctic summer sea ice is in irreversible melt down, the loss of its cooling influence to the entire northern hemisphere will further devastate American crops. Americans will then experience famine along with those billions of people who are today recognized as the most climate change vulnerable. This statement of yours to the Cancun climate conference will surely stand as your own record of your own guilt in this worst crime against humanity. Language has not been invented to adequately describe the enormity of this crime. The crime surpasses all the crimes of all the worst tyrants and terrorists in human history all rolled together. The successful sabotaging of the US greenhouse gas emissions control policy and international negotiations for global climate change mitigation policy condemns billions of the most climate change vulnerable and climate change innocent human beings to a horrible death from global warming and climate disruption, depleting their already meagre food supplies and already stressed water security compounded by the multiplication of tropical and infectious diseases — which after malnutrition is the second greatest cause of the already high premature death rates to these economically oppressed and deprived populations. Not surprisingly, being recognized as congress’s most outspoken skeptic on climate change, you are now gloating at what you describe as the "success" of the conspiracy to sabotage to international attempts to control global greenhouse gas emissions. You were speaking to Americans for Prosperity, a group partly financed by the oil industry that opposes government action on climate change and that has sponsored many Tea Party groups. In your message you urge your troops to take the attack against climate change mitigation to counter the US EPA greenhouse gas regulations. Intoxicated by your psychopathic success you openly admit your guilt in leading this greatest crime against humanity. Please, please, for God's sake, reflect on the inevitable terrible result of how you are abusing your powers, and use your considerable skills and influence in securing a future for America and the world by the conversion of the fossil fuel energy economy (which has no future however it is looked at), with the safe, clean, zero-carbon, everlasting world energy economy that is the only future that America and humanity has. Here's the scary part. 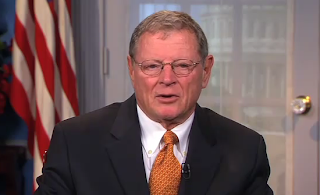 Inhofe says all these things with a straight face, like he's proud of himself. Ignorance (though I suspect he's more paid off than ignorant) is a dangerous — and in his case, deadly — thing. I pity the poor Oklahomans, and all Americans who believe that money is more important than life.